I went shed hunting at the deer camp this past Monday, and although I didn’t find any sheds it was a very good day to be out walking in the woods with my camera. As I was walking I saw a lot of deer tracks, some you could tell were doe tracks and some you could tell were made by a trophy buck. It always gets my blood boiling when I see a nice big set of trophy buck deer tracks. Have you ever been walking and when you see big boys tracks you stop in yours and follow them? Then, when you loose them you turn around and backtrack his steps to see where he came from. There is just something about seeing that trophy buck tracks that gets me going. You can learn quite a bit about the deer by the tracks. Most of the time you can tell if it is a buck or a doe, you can tell if it is a big or small deer, you can tell which direction it was coming from and going to. I have noticed that does front tracks will be on top of each other, while a big buck tracks will be further apart. I have heard that you can’t tell them apart but you can. A bucks hooves will be spread apart wide and a does will not. I like looking for deer tracks the next day after a good rain. You can really see them good then. 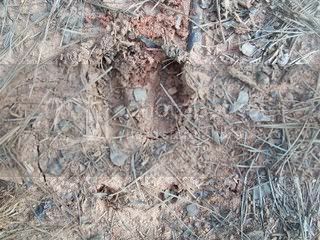 I like to hunt where I see a nice big set of tracks going both directions on a particular trail. I get fired up when I see that. I like to get in a stand just down wind of a trail like that. It always gets me fired up to see trophy buck tracks. I walked up on this nice set of tracks while I was out shed hunting Monday. If I had to guess I would say this buck was two to three years old. I was thinking about which one I would rather see, a big set of tracks or a big rub on a tree? That’s a good question. I don’t know which one I would choose. They both make me stay in the stand longer and want to hunt in that area. How about you? Would you rather hunt where there is a big rub or a big set of tracks? Tagged trophy buck. Bookmark the permalink.